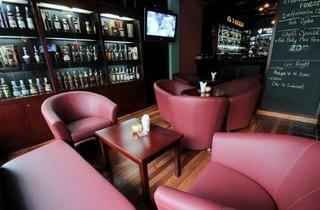 The Whisky Bar is very much a whisky bar, though not in a ghastly ’80s sense. 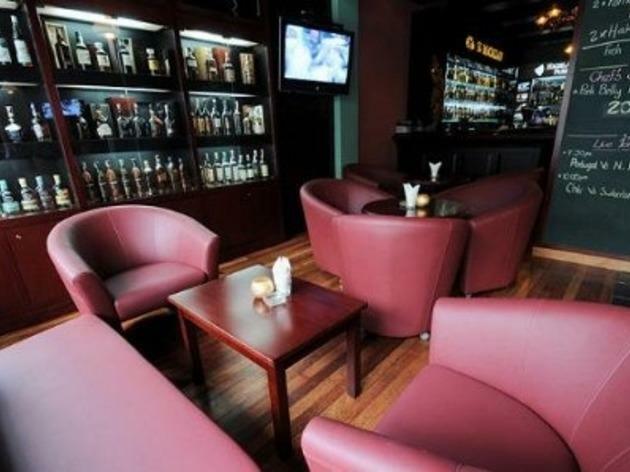 Those who possess a taste for the finer things will struggle to resist the allure of the curved leather chairs and a selection of, what seems like, hundreds of single malts that stand at attention against backlit glass shelves. Whisky newbies need not fear – the Whisky Bar’s expertise lies in gently taking you by the hand and soothingly introducing you to their single malts by way of tasting sets. I order Tasting Set Two (the beginner’s set) which consists of six different single malts at half an ounce each. Priced at RM65.80, it comes with a vial of water, an unusual ‘ice ball’ (normal ice cubes dilute quicker, I’m told) and handy tasting notes. I survey the varying whiskys – Aushentoshan, Benriach, Glen Elgin, Glenmorangie, Bowmore, Auran – in front of me and then, I am asked to pour in a splash of water. Probably because I don’t look like the neat whisky drinking type. It turns out that dilution is important for releasing the flavour and strengthening the nose. I give the Glen Elgin a quick swirl (vainly trying to hide my terrible swirling skills) and swallow a small mouthful that’s strong, but not in a distasteful way. Other whiskys vary in colour (from amber and honey to gold and straw) and taste (gooseberries, fruitcake or bitter fruit). The set is a brilliant introduction to the world of whisky – not too overwhelming and a chance to sample many. Werner Kuhn was shortlisted in the Restaurateur of the Year category of the Time Out KL Food Awards2010 and 2012. He was also shortlisted Outstanding Chef of the Year in 2009. Our food awards are 100% voted for by the people of KL. This way, we guarantee that popularity and consistent performance is rewarded.